New RACC Website Coming Soon. * The 145.110 repeater at Sulphur Springs does not transmit a tone, so make sure your radio is programmed for "ENC" only on that frequency. The 145.190 repeater is a wide coverage area stand-alone repeater that is not linked with any other repeater. * For local traffic only, use 94.8 / 94.8. Steven Smith, a lifelong resident of Atlanta, TX, went to be with the Lord unexpectedly on Monday, March 28th, at the age of 60 while doing what he loved most. He was the RACC Club President from January 2015 until his death in March 2016. Born to a pioneer Cass County family, Steven Fischer Smith began life on March 10th, 1956. His parents were Norman Larry Smith and Shirley Jeanne Fischer Smith. Steven spent a brief time in Longview during his grade school days before returning to Atlanta. He met the love of his life, Linda Bickham, at Atlanta High School, where both graduated in 1974. Steven & Linda married in December of 1976. They attended Stephen F. Austin State University before returning to Atlanta in order for Steven to assist in operating the family business, which later became Smith Wholesalers, Inc. He graduated from East Texas State University in Texarkana with a BS in Business Administration and went on to serve as President of this business for 29 years. Steven was preceded in death by his parents, Norman Larry and Shirley Jeanne Fischer Smith, Brother, Tom Richey Smith Holloway, and sister, Melanie Magnus-Roy. Steven loved his family and was a devoted husband, father, and grandfather. He was a believer in the Lord Jesus Christ and was active in First United Methodist Church of Atlanta for all of his life, serving in various leadership positions. He walked with the Lord daily and was a true friend to all who crossed his path. Many of his friends came from his multiple hobbies. His passions included drag racing, boat racing, and amateur radio; as a result of these hobbies, he had friends spread throughout the entire country. The Racers for Christ organization gave him the opportunity to share with others about his faith and hope in Jesus. Due to Steven’s love for his community and the city of Atlanta, he served in various civic duties. He was a founding member of the Atlanta City Development Corporation and served many roles in the Atlanta Chamber of Commerce, Lions Club, and Atlanta Education Foundation. He was chosen as Man of the Year for the City of Atlanta in 1989. Steven was posthumously honored as a Distinguished Alumni by the Atlanta Education Foundation in 2016. Greetings to all from the North East Texas piney woods. I am Steven Smith - W5YME and I am a sixth generation Cass County Texan dating back to the Republic of Texas. I became interested in amateur radio around age eight during my third grade school year. During Cub Scouting I was first exposed to the world of radio through the construction of a crystal radio. My father and I dreamed of getting into the amateur radios together some day however that dream did not begin to take place for many years. During my eigth grade year of school, a friend of mine and his father began using CB radios. This was a time prior to the CB boom in the U.S. The CB bands were pretty clear and just a handful of folks used this radio service in our hometown of Atlanta. My dad noticed my friend and his father enjoying the CB's as a father and son project and a short time later he purchased us two. My first CB was a Metrotek Pacer 1, an 8 channel tube type unit used in conjunction with a Hygain CLR-2 ground plane antenna. That was about all a person needed in those days. My first new radio was a Pearce-Simpson Bearcat 23, one that I was so proud of that I still have it to this day. We used the radios constantly through my high school and college years. I think I was the only guy in our high school with twin Shakespeare fiberglass whips on their car. These were also the days of FCC licensing in CB with strict rules and monitoring of the bands. We had a number of active Hams in Atlanta in those days, Dave Wommack – W5AVH, Willie Love - K5MFA, Robert Jones - K5HCM and others. Another lifelong friend, Dennis Smith - WB5SRM, picked up his ham ticket in 1976, just out of high school. In December 1976 I married my high school sweetheart Linda and in 1981 we picked up our novice licenses under the tutoring of Tevis Pappas – K5EJD. My wife Linda was KA5KJT and my application was lost in the process and after the reapplication to the FCC, I became KA5LEG. We set up a nice little ham shack at home with some Heathkit SB series gear and a Hygain 80-10 vertical trap and with our low power straight key began to work the world of CW as well as monitoring phone on many stations such as KC4AAA on a regular basis. In 1982 our second child was born and another bedroom was needed, so, there went the radio room. I moved the radios to our small bedroom closet and tried to operate them from the bedroom but that did not work well at all. I then prepared a place to set the radio gear up at work, but that did not work out as I was entering the busiest years of my career and juggling the needs of work and family along with desire to serve our church and community just left little time for radios. A short time later, a new ham in our community was trying to get started in the sport, Gary Stewart – N5UIU. Gary was new to the sport and on a tight budget, so I gave him my Heath gear and told him if he ever outgrew it or decided he did not need the gear any longer then to pass it on and help another ham operator. I don't know what happened to that gear, but hope it went to good use. It would be really cool to be reunited. Flash forward, after retiring from the petroleum products wholesale and retail business, I am catching up with past passions. I still have business interest, but most of my passions revolve around family, church and applied chemistry and physics. Currently I am the Crew Chief and engine builder on a NHRA Top Alcohol Dragster (A/Fuel) team with a long background in various car and drag boat racing ventures. A few years ago, a friend of mine, after being in the aircraft and real estate development endeavors for 28 years in northern Arkansas, moved back to our hometown of Atlanta. What I have not mentioned in this bio is this friend is Jim Collom - N5YU a near lifelong friend, and the same person whose father purchased those first CB radios that began our radio transmitting ventures back in 1969. Upon Jim's return to Atlanta he began to encourage me to re up my ham ticket. As a not so young guy anymore, I was concerned about my abilities to reenter the world of radio . Steve Ferrell – KB5YMB also encouraged me and brought me Technician class study material. Jim brought me a flyer from a local pending Hamfest in Texarkana. I then decided to study the material, attend the Texarkana Hamfest and test. So, my wife Linda and I attended local hamfest, had a great time and I left with both my Technician and General class tickets, as well as winning the Hamfest third prize, a dual band HT. A few weeks later, with help from local club members and Volunteer Examiners, especially Steve Ferrell – KB5YMB, Jim Collom – N5YU, Jo Ann Collom – KB5SQL, Jason Patterson – KD5RQB, Carolyn Patterson – KE5BPP and Carol Johnson – KB5TCH, my wife Linda completed her technician license testing and is now W5OME. So, after some 50 years of a dream, Jim and I along with our wives are enjoying amateur radio and we Iook forward to continue serving our community through radio and exposing the sport to our grandchildren and others . http://www.freedom-link.org - "LINKING COMMUNICATIONS WITH FOUR STATES"
If angels exist in heaven, then surely Steven Smith is today being fitted for his wings—a loud, noisy, very fast pair with a checkerboard pattern. Those of us left behind will gather at Atlanta's First United Methodist Church at 11 this morning to bid farewell to a kind, wise, soft-spoken man who had an unmatched passion for his Lord, his family, his church, his community, his friends, his university and for breathtakingly fast cars and boats. Steven, 60, died Monday afternoon in a freak accident at Thunder Road Raceway in Gilliam, La. He was helping his brother, Stuart, earn his National Hot Rod Association license in an alcohol/fuel dragster the brothers have raced in the Lucas Oil series with Forrest Fair at the wheel since 2011. We're not talking backyard, souped-up go-karts here. We're talking about 270 mph, quarter-mile in 5.3 seconds monsters. 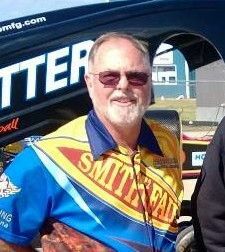 I've done some wild things behind the wheel, but nothing like the Smith brothers, both of whom over the last three decades or so have brought home plenty of trophies in dragsters and drag boats they built and drove themselves. I brag that I actually know guys with their own dynamometer. Operating out of the same warehouse in which he ran the family business, a fuel distributorship, Steven, the engineering brains of the outfit, used to regale me with details of his latest engine rebuild. I would try not to let a glaze settle over my eyes as he rattled off strings of terms that sounded vaguely like English. Racing was one of Steven's many and varied passions. He loved his hometown of Atlanta, Texas, and was an ardent supporter of anyone new to town or of anything that might help it. Economic development, education, a growing church—Steven would generously lend his time, talents and resources. Chamber-of-Commerce, Man-of-the-Year stuff. I know. It was 33 years ago when I meandered into Atlanta as an itinerant newspaper editor. Didn't know a soul, but fortunately I'd had the good sense to be reared Methodist. I was sitting in church one Sunday morning, when a smiling, bearded fellow gently put his hand on my shoulder. "My family would love to have you over for dinner today." I can't begin to tell you how great a home-cooked meal sounded. That was the day I first began to know Steven and Stuart, their lovely wives, Linda and Lori, their doting mother Shirley, and the head of the clan and star of the show, the exceptional and unforgettable Larry Smith, who passed on to his sons a twinkle in the eye that was born of a deep and abiding love for life itself. I did not have the pleasure of knowing two other children. To this day, I have never seen a family that was so respectful of each member, that listened so closely to one another, that so enjoyed each other's company. The conversation was bright, funny, kind. I wish I could say that we went on to become the closest of friends, but life has a funny way of intruding. In a few years I was off to run a newspaper in another town. I returned some years later, and though I so enjoyed being a part of a church family with them, then, as now, my plate tended to stay full. Still, it was just Monday morning, the day Steven died, that my son Jonathan and I were talking about the Smith brothers. There was a time when Steven taught Jonathan how to run the church's sound system, giving him insight into computers, electronics and networking, helping to ignite a passion that continues to grow. More importantly, Steven's gentle teaching and soft-spoken self-confidence served as models that helped shape Jonathan into the man he is still in the process of becoming. I also recall trusting my son, along with a hot-shot sports car that had been put into my care, to Stuart. The grins on their faces when they returned told me all I needed to know. I would trust him again tomorrow. Testimonials to Steven fill the social media his week, and all tell things similar to what I've said. He was a better man than me: kind, gentle, faithful, loyal, reliable. I can't remember us having a cross word or being at cross-purposes, and if you know irascible me, you know that's a credit to Steven. In a church known to have an occasional, high-drama kerfuffle, he was a rock, the very epitome of Christian love and servant leadership. Like his father, when called on Steven could deliver a sermon that both informed and inspired. His prayers were deep, thoughtful, eloquent, the prayers of a man who daily walked and had profound talks with God. He loved his family. He lived a blessed life, but for evidence of God's blessings he looked no further than his seven grandchildren: Ashlyn, Luke and Mason Novak and Carson, Caroline Rose, Colleen and Cullen Duke. Look at his Facebook. If it's not about race cars, it's about them. And he loved his younger brother, with whom he spent almost every day of his adult life. If Steven is one of the most loving men on the planet, Stuart is one of the most lovable, the family's free spirit, full of sparkle and elan, but no less imbued with moral strength and the desire to serve. From what I gathered, health problems have forced Fair to step back from driving the dragster, so the guys were getting Stuart licensed to drive it, a dream Stuart has quietly held for several years, in the health club before dawn to stay in shape. What's it like behind the wheel of a roaring fireball? "Nothing to it," he once told me. "Just keep it between the lines." They were getting ready to make a run, I'm told, and Stuart had done a burnout. He was backing the dragster up when something went haywire with the fuel system and the engine started revving on its own. As Steven approached from the rear, the car exploded backward. On-track medical staff immediately summoned a helicopter, and Stuart rode in it to the hospital, where Steven was pronounced dead. How? Why? Does it matter? As an old trooper once said, that's why they call them accidents. Those of us who know Stuart know that he will bear the yoke of his brother's death until his own, so there's the second tragedy in this. I would do anything to lift that burden, and I pray mightily that the Lord will find a way. So, Steven, if you're looking down on us—and I'm sure you are—would you please remind the Big Guy that we understand the lesson of the Resurrection, but for those of us bound to this mortal earth, on this day, death, indeed, has a sting.